Canadians and Americans are eagerly awaiting the broadcast of Season 4 of the acclaimed series Downton Abbey, which begins on Sunday night on PBS. I am sure that viewers have been anxious to find out what will happen next in the life of their favorite upstairs or downstairs character. For me, waiting to see what the women in the series will be wearing has been equally difficult. 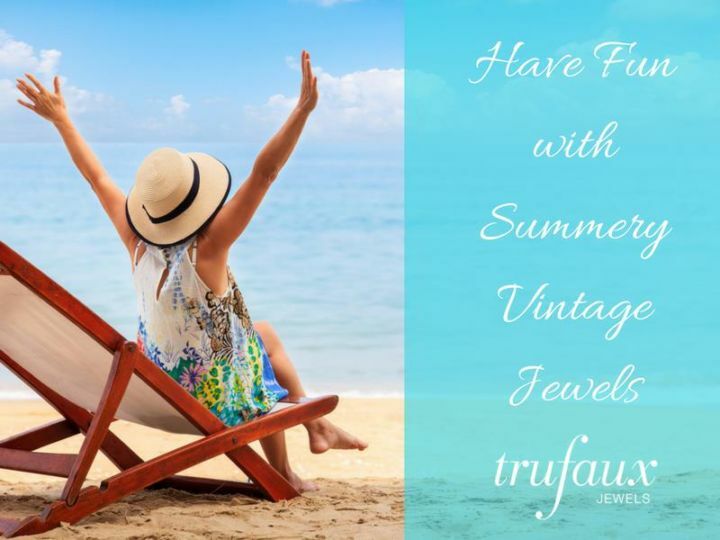 Celebrated costume designers Susannah Buxton and Caroline McCall have provided eye candy for all of us who love vintage apparel and jewelry. 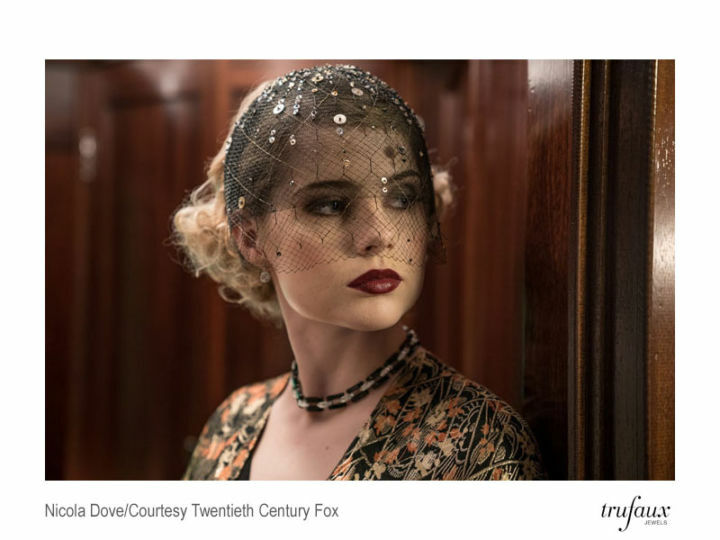 While I can’t predict what we’ll see in Season 4, I can provide some background on women’s fashion and costume jewelry in the 1920s. 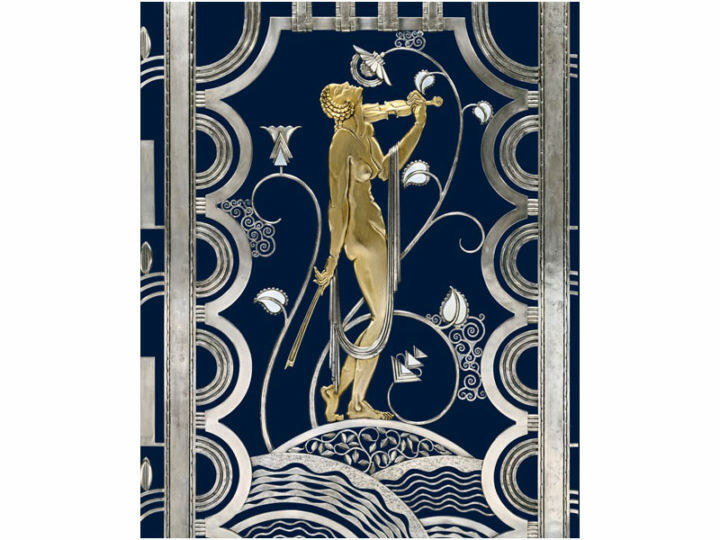 Click through to see Downton Abbey jewelry in the Art Deco collection on the TruFaux Jewels website. Take a look at my Pinterest board for a glimpse of early 1920s fashion and accessories. Season 3 took place in 1920, with the Christmas Special in 1921, and Season 4 will open in 1922. But don’t expect to see the 1920s flapper look, except perhaps on young and rebellious cousin Rose and her friends. La garçonne, another name for the flapper style, didn’t come into fashion until the middle of the decade. As we saw in previous seasons, the enormous changes resulting from World War I also revolutionized fashion. Women’s clothing became less restrictive, which reflected their changing roles in society. The first two years of the 1920s marked the beginning of the Art Deco era and provided a transition from the post-war silhouette (where waistlines were just under the bust, and hemlines were ankle length) to that of the flapper. 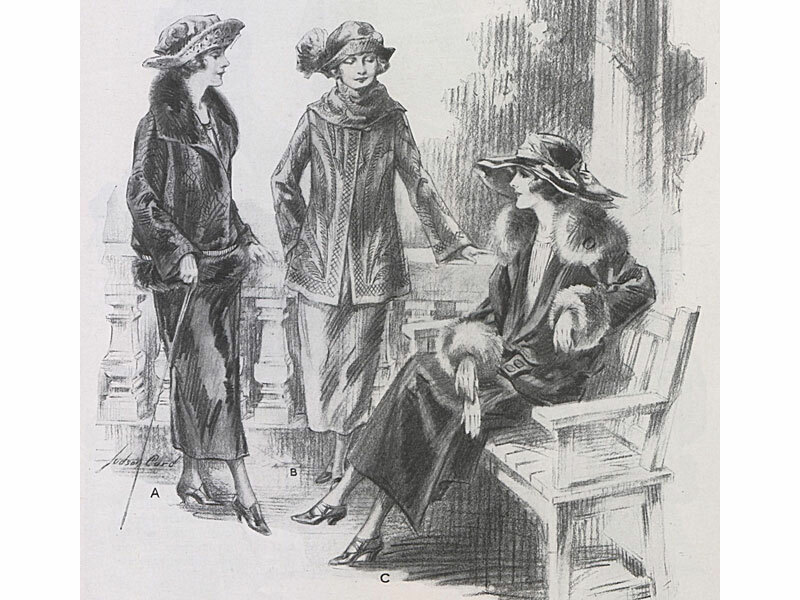 “At the very beginning of the 1920s it was fashionable for women to wear high-waisted, rather barrel-shaped outfits, and tunic-style tops were popular. However, between 1920-22 the waistline dropped to hip level, obscuring natural curves for a tubular, androgynous look” (Victoria & Albert Museum website). Women’s waistlines remained at the hips for the rest of the decade. Hemlines for daywear were just below the calf from 1920-22, then at ankle length until 1924; hemlines rose to the knee in 1925, where they remained for the rest of the 1920s. 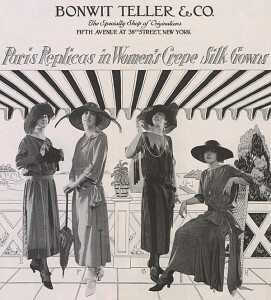 This ad from the May 15, 1922 issue of Vogue illustrates the style in daywear and accessories for the period. As you can see, attractive shoes replaced high-button boots when hemlines rose. You may have noticed in Season 3 that as hemlines rose, women’s hair also got shorter. Part of this change was due to the practicality required by women working in factories and on farms; part was also due to a general liberation in fashion. While we have not yet seen the straight, short bob associated with the flapper, we have seen shorter, curled hair on our fashion-conscious female characters. With shorter hair in style, women’s ears required adornment. 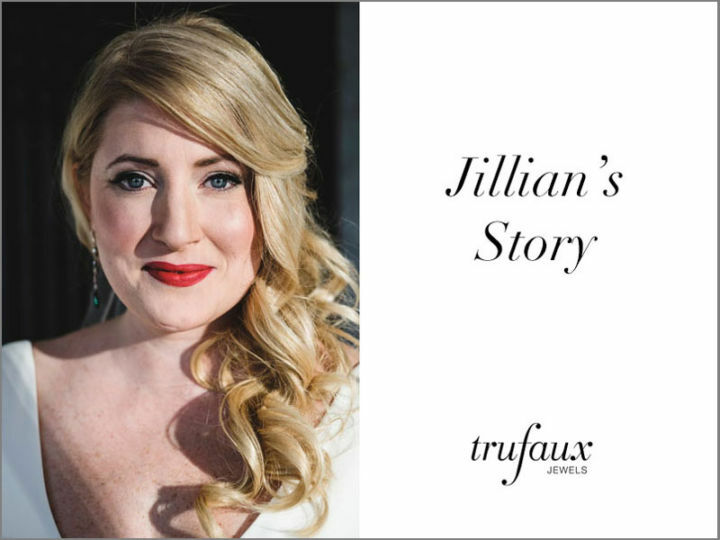 While an August 1, 1901 Vogue article decried the wearing of earrings as “semi-barbaric”, they continued to gain popularity and length in the first two decades of the 20th century. 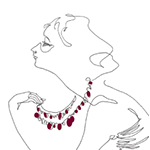 Articles on accessories in early 1920s issues of Vogue illustrated many styles of long pendant earrings that are costume jewelry, although that term was not used. Instead, words such as crystal, imitation sapphires and silver described the earrings’ components. Clear crystal stones and beads (to imitate rock crystal) and richly-colored glass stones, to imitate precious gemstones, were important components in most jewelry produced in this period. Shimmering stones (pastes and marcasites) were used alone or to accent or contrast the others. Strands of beads of varying lengths and the all-important strand of pearls were popular at this time. Long necklaces were also wound around the wrist to form a bracelet. By the early 1920s, ropes of pearls were in great demand, and artificial pearls provided by French makers were in abundance. 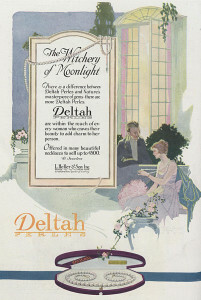 As this ad for Deltah Perles (from the June 1, 1920 issue of Vogue) states: “There is a difference between Deltah Perles and Nature’s masterpiece of gems – there are more Deltah Perles … Deltah Perles are within the reach of every woman who craves their beauty to add charm to her person”. By this time flexible bracelets (also known as line bracelets) had made their appearance in both precious and costume jewelry. My earliest Vogue image for the latter is in an article entitled “Seen at the Jewelers” (March 15, 1916), which describes the bracelet as follows: “Flexible as its diamond prototype with every stone set separately to give it light and color, this rhinestone and silver bracelet is an amazingly pretty copy of an expensive piece of jewelry”. These bracelets remained an important wardrobe accessory throughout the 1920s, when they were worn in multiples. In addition, filigree bracelets, brooches, earrings and necklaces continued to be worn in the early 1920s, another trend that continued through the decade. We saw many filigree pieces worn by the Crawley women in earlier episodes. Additional information about the series characters (and what they wear) can be found in The Chronicles of Downton Abbey: A New Era (by Jessica Fellowes & Matthew Sturgis; St. Martin’s Press). To learn more about Downton Abbey costume designers Susannah Buxton and Caroline McCall, read Cornelia Powell’s excellent article “The Costumers of DOWNTON ABBEY” in the January/February 2014 issue of Victoria magazine. Mark your calendars for the exhibition Costumes of Downton Abbey at Winterthur Museum, Garden & Library, from March 1, 2014 to January 4, 2015. As a vintage clothing dealer (for many, many years) I want to compliment you on your article; well-written, well-researched (obviously) and succinct! Thank you so much, Judith. I really appreciate your feedback!